I was in a bit of a grumpy mood on my way to Fourpenny House. All that melted away as soon as I walked in to see a cozy well-decorated room, a fire crackling, a happy people enjoying quality food and drinks, and a small group playing traditional Celtic music for the crowd's entertainment. It was a pleasant scene, and I immediately wished Fourpenny was closer to my house so I could visit more often. That wish was solidified throughout the rest of my visit. I first stopped into Fourpenny House on a Sunday in May 2018, during their soft opening phase, hoping to try both their beer and their Sunday roast dinner. Unfortunately we were too early for the roast dinner, but they did have a few beers available. Even then, I thought their house Scottish Ale was very good. Since then they have not only dialed-in recipes/processes and added many more beers to the menu, they have hired a new brewer who brings a lot of experience and seems to be off to a great start. My second visit was in early January of 2019. Again I missed the Sunday roast dinner (it starts at 1:30pm), but the Sunday brunch offerings were available. The omelette with avocado, Irish bacon and cheddar was delicious (though it was much too large to finish: two people could share it and still be satisfied). The kitchen accidentally made an extra order of the house Fourpenny toast, baked with spent grains from brewing, and shared it with a few of us at the bar, too. Although my main focus was trying the beer — there were seven house beers on the board plus quality guest taps like Harp and Guinness — someone ordered a smoked Auld Fashioned made with Scotch whisky and the smoking process looked so cool I had to try it. Several other people at the bar felt the same way, so it turned into a bit of a bonding thing. It seems that Fourpenny succeeds in creating a friendly pub atmosphere. And the Auld Fashioned turned out to be great. Worth the trip to La Mesa by itself. Service was excellent from every part of the operation--friendly, helpful, efficient. Food was a little slow to come out, though I did arrive at the height of the lunch/brunch rush and the place was pretty full. From what I could see around the restaurant, all the food was excellent. The beer exceeded my expectations. Overall, I give Fourpenny high marks. 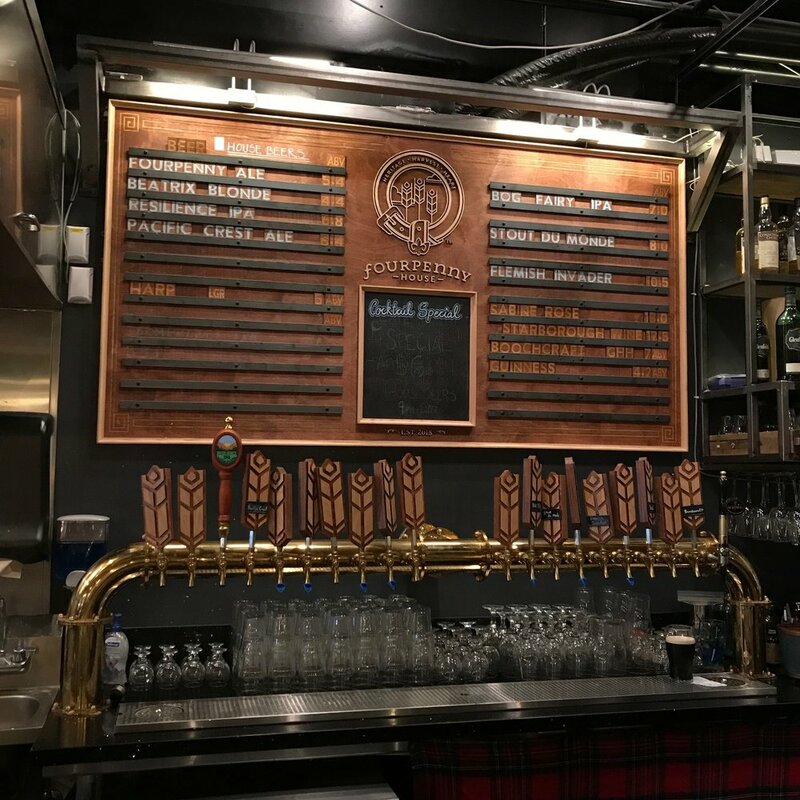 It is as close to a Scottish pub as you can find in San Diego, with very good beer and food. Beth Demmon's article on Fourpenny House came out in San Diego City Beat the day after I visited the location. I delayed publishing this so as not to step on toes. She comes to much the same conclusion. Fourpenny is a place you should visit!